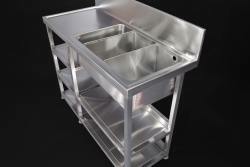 Bar sinks are a critical item for the efficient use of the limited space often available. 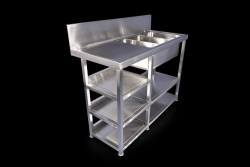 Our units, manufactured from food-grade stainless steel is an attractive yet hard wearing material. Easy to maintain, with inbuilt antibacterial properties, it is also supremely durable and impact-resistant: it will last for decades, making it the cost-effective choice for your bar or restaurant. 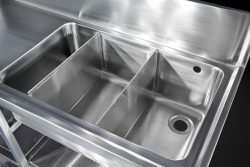 Your bar sink will also be easy to maintain: simply wipe the surface clean, to retain the metal’s attractive shine. Our bespoke service means you can order the exact combination of bowls, drainers and storage that you need for your service counter. 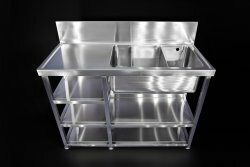 Whether you require a single basin to set into an existing worktop or want an entire sink and storage unit, with a steel support frame and integral counter, our engineers can fabricate it. The bowl can feature removable partitions, for separating ice/lemon slices/bottles/etc., and we can incorporate a small, separate bowl for hand washing. Whatever you need, we can produce it. We can also supply standalone cupboards, plus trolleys, tables, shower trays and even entire kitchens. Again, all of these products will be fabricated by our skilled engineers, to your exact specifications. Get in touch today, to discuss your requirements.